For my 21st birthday, two of my oldest friends gave me a tagine. I cannot stress enough how much this tagine means to me. If you don’t know what a tagine is, I am glad to make the introduction, I’m pretty sure it will become your favourite object. Think of a tagine like a slow cooker. You do all the work in the beginning and then you leave it to do its magic and you come back to a warming pot of food. 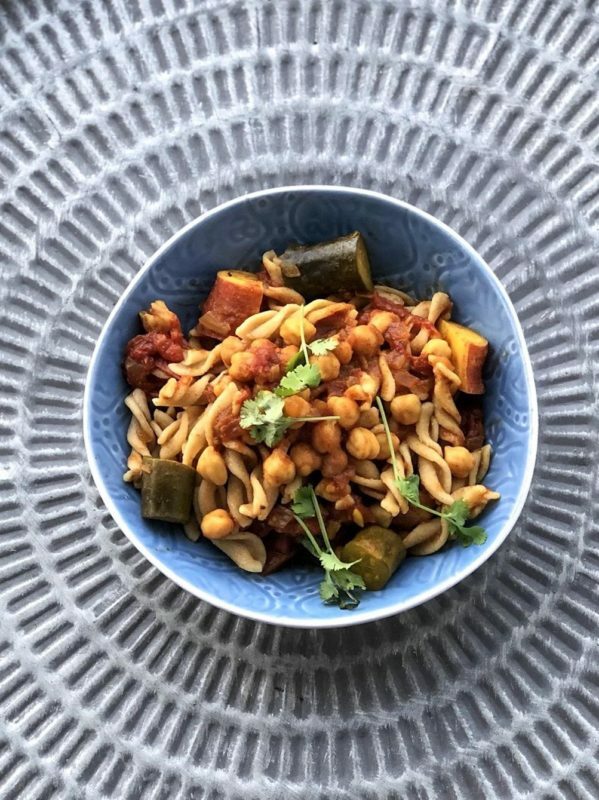 Chickpeas are little golden nuggets packed with all the nutrients and fibre you never knew you needed. Check out my Warm Glow Bowl for the full scoop on why dynamite comes in small packages when it comes to this humble legume. Chickpeas are amazing at lowering bad cholesterol (LDL) by at least 17% which may seem small but is incredible when you look at how tiny these legumes are! Add the garlic in and cook it for about a minute or two. Add the sweet potatoes and baby marrow and mix it until they are all covered in the base. Add the tinned tomatoes and one tin of water. Bring everything to a boil and turn it down to the lowest heat, place the lid on the tagine and leave it to cook. If you are using a pot, bring it to a boil, lower the heat and place the lid on. A pot will cook much quicker than the tagine. When the sweet potatoes start to soften, take the lid off the pot and leave it to become thicker. When the sweet potatoes are nearly completely cooked, add the chickpeas and give it a stir. In the meantime, bring a pot of salted water to a boil and add the pasta and cook according to the packaging. When the pasta is complete, add it to the tagine/pot and stir through some fresh coriander. Hi! My name is Korkor Opai-Tetteh. I truly believe that a third of my being is dedicated to food – good food – that is made with love! 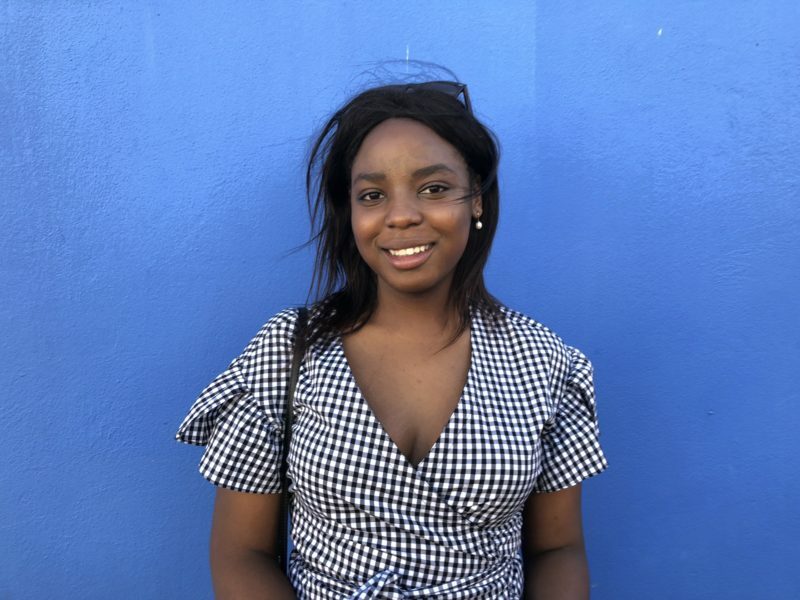 When I’m not busy cooking, I am a medical student at the University of Cape Town. You can find more delicious recipes and updates of my veggie adventures on my blog and Instagram page. 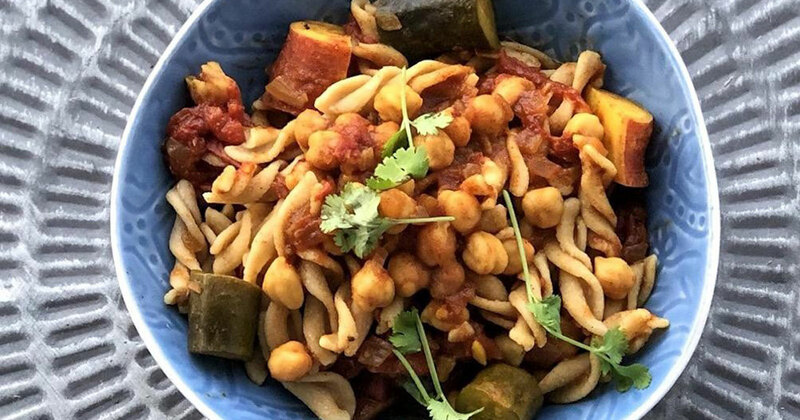 This entry was posted in Recipes and tagged Chickpea pasta recipes, Happy Earth People, Healthy recipes South Africa.